When the fossil of Sue the T. Rex came to the Field Museum 20 years ago, scientists removed the rock surrounding the dinosaur’s bones and packed it away. The leftover sediment sat in underground storage at the museum until recently, when researchers and volunteers began picking through the rock in search of tiny fossils. What they found, it turns out, were the remains of a shark that lived in a river where Sue likely went to drink water. The discovery came in the form of fossilized teeth the size of pepper flakes. Nordquist’s finding led to the classification of a new shark species, which is described in the latest edition of the Journal of Paleontology. The research team, led by North Carolina State University paleontologist Terry Gates, named the shark Galagadon nordquistae, a nod to the shark’s teeth – which have a stepped triangle shape resembling the spaceships in the 1980s video game Galaga – and to Nordquist, who has been sifting through dirt to find tiny fossils for the Field Museum for 15 years. According to the museum’s curator of dinosaurs, Pete Makovicky, the shark lived at the same time and in the same part of the world as Sue, the Field’s world-famous T. Rex, who moved into a new 5,100-square-foot home on the museum’s second floor last month. Most of the shark’s body was not preserved because shark skeletons are made of cartilage, Makovicky said in the museum’s press release. But thanks to Nordquist, researchers were able to identify the shark through its tiny fossilized teeth. “It’s literally the smallest fossil I’ve ever worked on,” Makovicky said last month during a kick-off event for Sue’s new digs. The teeth are just a millimeter wide, and the shark to which they belonged was also small, measuring less than two feet in length. The shark would have been comparable to bamboo sharks living in the Indian Ocean today, with a flat face and camouflage colors, according to the Field. 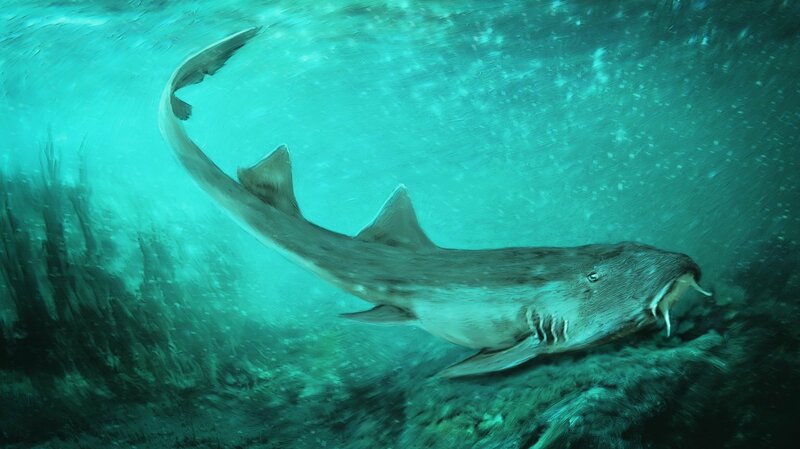 Researchers suspect the shark would have eaten small invertebrates and probably spent much of its time lying on the bottom of the riverbed. For Makovicky and other scientists, Galagadon’s discovery has caused them to question what they thought they knew about the area where Sue was found, near Faith, South Dakota.